It’s summertime in LA! That means, it’s time to bust out the blankets, the picnic baskets and bottles of your favorite wine and partake in all the outdoor activities this city has to offer. 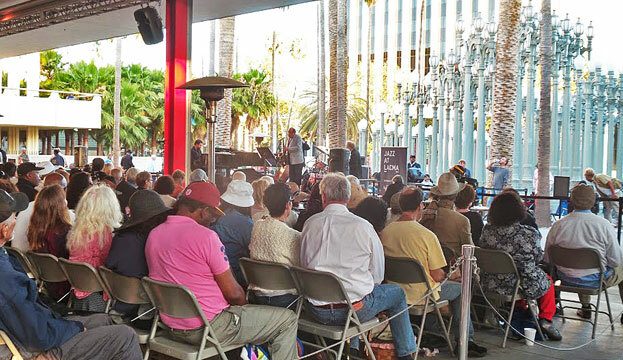 Thanks to the Los Angeles County Museum of Art, better known as LACMA, we can start our summer weekends off right with Friday night Jazz in the museum’s courtyard. According to the website, this event has been happening for over 20 years and based on the turnout, it’s got 20 more to go! It’s a staple in the city and an event that hundreds of Los Angelinos (and visitors of LA) attend. Honestly, I don’t remember actually hearing the jazz band’s performance because of all the people chattering. The good news, however, is that if you’re a part of the 20% who’s there for the show, there is seating available in front of the stage. 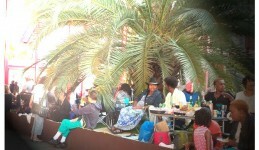 But for you other 80% who are going to picnic, there’s plenty of lawn available. Now through September 26, head out to LACMA every Friday evening at 6 p.m. for free live jazz and a good time. Bring your friends, a blanket or chair and some wine and cheese and really get into it. Cons: Parking! If you’re not there early, you will circle forever. 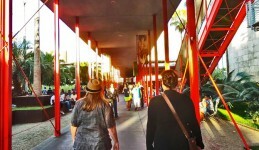 Even the LACMA lot was full by 6:30 p.m.